It’s customary, at Passover, to say “Happy Passover” to Jews celebrating the eight day holiday. Passover starts this week (April 19) with a “seder” (say-der), a ritual dinner which for less observant Jews turns into a huge, noisy family-and-friends occasion and multi-course feast — though without bread, anything made with bread or anything made with flour or yeast. But Passover does not deprive the Jewish people of their carbs. Observance of Passover not only substitutes matzo, unleavened like a cracker, for bread but requires matzo as part of the seder ritual. Fortunately, matzo is a major and varied food group. You can get gluten-free matzo, whole wheat matzo, onion matzo, garlic matzo, onion and garlic matzo, chocolate-covered matzo — and, I wouldn’t be surprised, gluten-free whole wheat chocolate-covered onion and garlic matzo. You can also make a delicious snack or dessert with matzo (recipe below) that mixes crumbled matzo with melted chocolate, coconut, almonds — probably the best use ever of matzo unless you use it as a substitute for packing material. 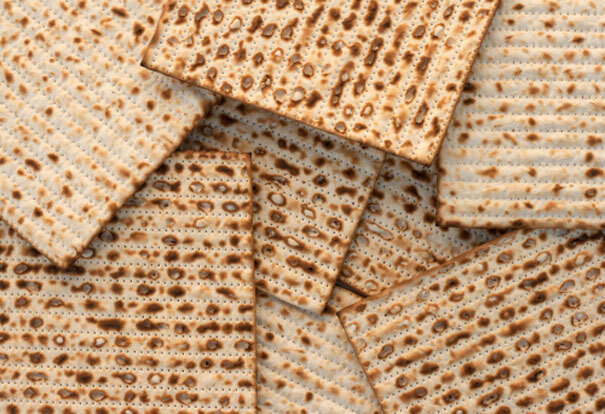 Jews have spent more than two millennia devising ways to make matzo palatable and to devise recipes that fool you into thinking it’s not even Passover because you don’t have to give up bagels, sandwiches, stuffing, cupcakes, tortes, coffee cakes — all made with finely ground matzo in place of flour. It’s literally having your cake and eating it, too. Nevertheless, some of us will opt for a Paleo Passover. It’s true that cavemen didn’t observe Passover. But they didn’t eat bread either. Passing over carbs at Passover is a perfect opportunity to max out self-righteousness and get two “mitzvahs” (fulfillment of commandments) at the same time. One benefits the soul: obey a religious precept of Passover. The other commandment benefits the body: lose weight. Besides, how hard is it to give up a sandwich made with ground-up matzo? Passover presents other challenges, too. In some ways, it’s the payback for not having to deal with Christmas. Extended and fractionated families reunite (or fight) at seder tables. Spouses argue about which in-laws’ seder to attend. In split families, arguments ensue about who gets the kids for the seder. Guests announce in advance special dietary requirements far beyond vegan, gluten-free or paleo. The good news is that no decorations are required. The bad news couldn’t be worse. Very observant Jews have to get rid of everything in the kitchen and start all over with special dishes, utensils, pots and pans; anything used with bread or flour has to be replaced. Orthodox families have kitchenware reserved for Passover; some even have kitchens reserved for Passover. Even semi-observant people clear the kitchen of all bread products and scrub shelves, cupboards, stove and refrigerator to remove any traces. Still, as with Christmas, some of the most treasured memories of childhood are the seders spent with cousins, an uncle who shushed us kids for making too much noise during the ritual reading of the Passover story, a grandmother who’d supervised the winemaking, the haunting melodies of the songs we sang once a year. It’s not the bread we miss at Passover. It’s the people. 1. Coconut-Almond Haystacks: Melt the chocolate chips according to the directions on the package, and stir until smooth. 2. Combine the crushed matzos, the coconut, and the almonds in a large mixing bowl. Pour the melted chocolate over the dry mixture and stir until all of the pieces are coated. 3. Use a teaspoon to dollop haystacks onto a sheet of parchment or waxed paper, or into paper muffin cups. Allow the treats to cool (about 10 minutes). Makes about 60 pieces.